This week Tony Stark will be the big hero on the big screen in Iron Man 3, but Jackie Robinson was quite the spectacle to see blazing around the base-paths in 1947. His energy and strong attitude led him to take greater risks than the average ballplayer. In fact, he garnered a league best of 29 steals, and, as Brian Helgeland's recent movie 42 would like you to think, ole Jackie never got caught once. he real Jackie Robinson may not have too many skeletons in his closet, but this film paints him as perfect as his stolen base record. But there's something to be said for the fact that his "perfect record" was due to the fact they didn't keep "caught stealing" as a statistic back in 1947. In reality, he was caught 11 times. Yeah, so what? As a director, Helgeland chooses to regard Robinson as this flawless hero, taking the safest bets possible, relying on glossy lenses and emotionally manipulative dialogue to get audiences enthralled. He goes against the norm of today's biopic and presents a flawless, heroic retelling of Jackie's journey into Major League Baseball while avoiding any of his possible faults. Helgeland's safe path was chosen with the purpose of going above presenting a story we already know or simply fleshing out an American hero. Instead, it aspires to be a blueprint on how to find inner courage to overcome some of the world's darkest obstacles. We are not to look at Jackie as human, but as a set of ideals that can help progress our culture away from hatred. The film may be a bit overwrought with common drama and cheesiness, but its sentiment and purpose is right where it needs to be: on inner-strength. The film moves quickly, having Jackie, played by a very capable Chadwick Boseman, hop and skip his way through one emotionally draining scene after another. The entire production seems obsessed with reassuring the audience that Jackie is the right man who can handle the pressure. And go figure - he can. In fact, he seems to thrive in the limelight. We see him maintain his composure throughout; he never throws a punch and only occasionally raises his voice. Even when the pressure of the world becomes more than he and his wife can bear, the film rescues Jackie with help from the older, wiser Branch Rickey (Harrison Ford). Rickey's words and advice inspire Jackie to not "meet [the enemy] on his own low ground." With Jackie's inner strength and Rickey's wisdom, Helgeland seems to frame these two brave men as if they were creatures born for the sole purpose of integrating baseball. They have all the skills and emotional strength necessary to succeed without a hiccup. So when they accomplish this task, we feel like the film was a bit like a cardboard cutout of a biopic. Perfection in today's culture is unheard of. Even Tiger Woods, seen as the perfect athlete on and off the course, eventually fell back to Earth. Heroes in today's society are bound to fall if we just wait long enough. This is now the norm: our heroes are only human, and through recent biopics we find Hollywood has only reinforced this notion. Modern biopics attempt to create a fully rounded human being with both their faults and accomplishments presented simultaneously. 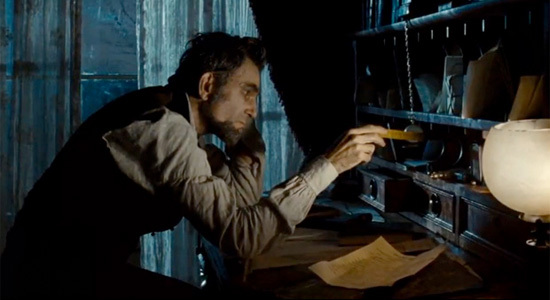 Steven Spielberg's Lincoln gave us both an abolitionist leader and a sullen depressed leader. Last year's quirky Hitchcock implied there might have been a true "psycho" lurking inside little Alfred's brain, as he is overwrought with jealousy and fear. The Iron Lady starring Meryl Streep completely undermined Margaret Thatcher's strong, powerful persona by interlacing scenes of her as a sad elderly woman struggling with dementia. In each case, our heroes (Lincoln, Hitchcock, and Thatcher) are truly heroic people that should be admired, but they are far from flawless. They are afflicted with depression, jealousy, and a terrible disease for the entirety of their films. In biopics of the past, the hero may have struggled with an affliction for one horrible scene or sequence, but today he must deal with it continuously. The modern hero rises to the occasion not because they necessarily overcame their faults, but because they learned how to succeed with them. Jackie's tale could have been treated the same way. It could have focused on the heavy emotional strain or a growing anger and resentment that lived inside him. But again, 42 is not about Jackie Robinson. It is about producing a role model whose respect and patience defeats ignorance and hate. A modern version of Jackie Robinson - simultaneously flawed and heroic - only weakens his inner-strength. He becomes just another tragic hero. Helgeland envisioned his Jackie Robinson as one of our action stars – an unyielding, unstoppable hero. Because biopics tell us more about our own culture than the actual person being presented, we can look at Helgeland's Robinson as a desire to get back to our heroes before they lost their privacy and gained their humanity. He emphasizes Robinson and Rickey's calmness and grace under pressure as a statement of what it means to be a modern citizen. 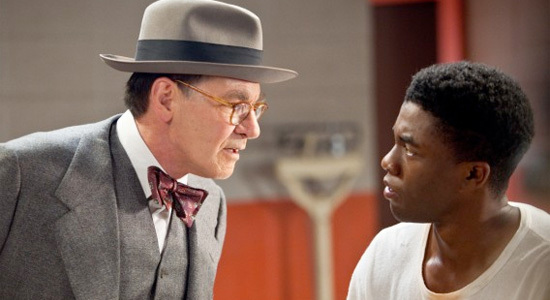 42 emphatically reminds us that racism and prejudice lurk inside every town in America. It is passed down from father to son, transferred from friends and relatives, and can put pressure on even the most well-intentioned person. Throughout the film, we see this transfer of hate swirling around our ever-strong number 42, until finally Helgeland puts all the racist chips on the table. 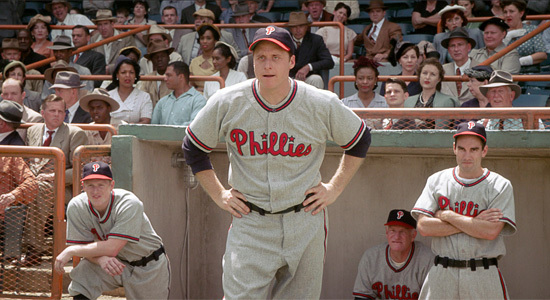 The most powerful scene is centered on a nasty encounter with Phillies Manager Ben Chapman (played by Alan Tudyk). Every single time Robinson steps in the batter's box, the racist manager heckles him with language that would make a sailor blush. The offensive language eventually pushes Jackie to his emotional limits and leaves him screaming in the hall outside the dugout. This trial is the hardest to watch and Chapman quickly becomes the embodiment of hatred. Helgeland is almost asking us to look at ourselves and ask, "Could I have the inner-strength of Robinson?" or even, "Am I capable of such strong prejudice?" These thoughts cloud our minds because the scene is not about Jackie's strength but about viewing two archetypes of good and evil facing off. Two separate weapons, one of steady patience and the other of aggressive hatred, are seen battling it out. In the end, like a good blueprint should, Robison and Rickey's grace and courage to not fight back leads to the desired outcome. Robinson wins the ball game and Chapman later apologizes and after the season never coaches again. 42 is a tale about strong-minded, courageous heroes that don't need to have a downside. This notion in our current culture makes us a bit squeamish. We like our heroes to be human, so it's a good thing that the film is not about humanizing Robinson. It's about destroying prejudices, finding our own inner Jackie Robinson, and finding strength in family and friends and stop this hate by not giving in to it. A question the film asks repeatedly is: why did Branch Rickey decide to break the race barrier and bring Jackie to the big leagues? With each response we go deeper inside the psyche of Rickey. Each answer is true, but each one tells a tale of why we, too, should break the cycle of hatred. At first it was for the money, a tool to push racism aside; after all, all money is green. Later, he admits he wanted to make up for a misdeed, where he did too little to help another black player. Finally, he explains that he needed to make things right inside himself because he could not love a racist game. This selfishness is exactly what Helgeland is asking his viewers to take away from the film. Don't admire Jackie for what he has done, but for how he did it. And don't treat each other fairly because we are told to, but because we couldn't live with ourselves if we didn't.